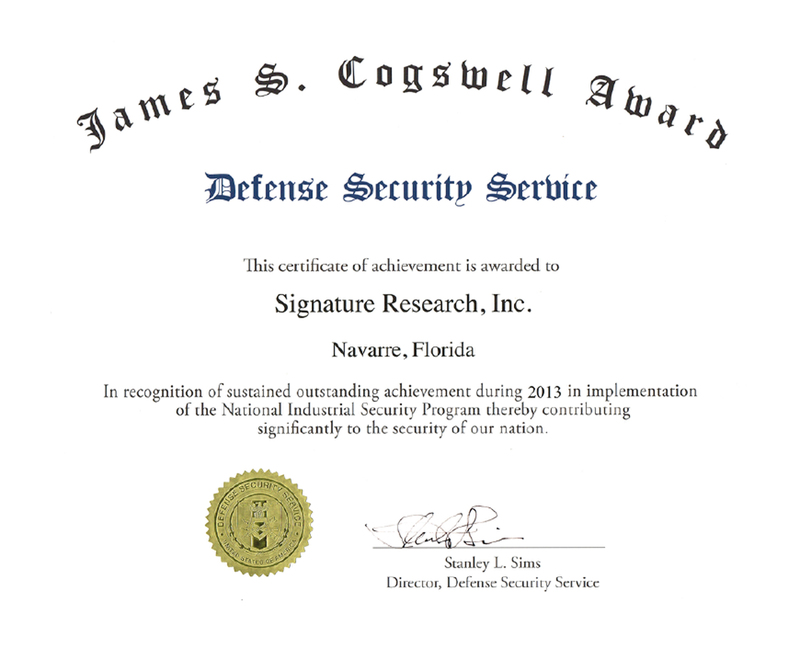 Signature Research, Inc. received the James S. Cogswell Award for outstanding Industrial Security Achievement in 2013. The Cogswell Award, established in 1966, is named in honor of the late Air Force Col. James S. Cogswell, the first chief of industrial security within the Department of Defense. Cogswell was responsible for developing the basic principles of the Industrial Security Program, which include an emphasis on the partnership between industry and government to protect information. The Cogswell Award selection process is rigorous. A DSS Industrial Security Representative may only nominate facilities that have at a minimum two consecutive superior industrial security review ratings, and which show a sustained degree of excellence and innovation in their overall security program management, implementation and oversight. The Cogswell Award is given for outstanding achievement in matters related exclusively to a facility’s security program. DSS makes the final selections.